Clarets striker Sam Vokes has signed a new three-and-a-half year contract at Turf Moor. The Wales international has extended his deal to the end of the 2018/2019 season, at a place he feels is his footballing "home". 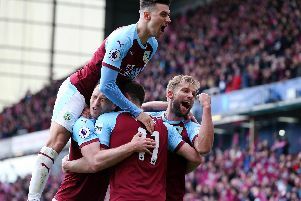 Vokes, 26, signed new terms two years ago as he and Danny Ings hit 47 goals between them to help fire Burnley to the Premier League, only for a cruciate knee ligament injury to rule Vokes out from March that year until his return on Boxing Day. He netted in January last year to earn an FA Cup third round replay at Spurs, and has five goals in 27 appearances so far this season. Vokes, who joined Burnley from Wolves, after a previous loan spell, in the summer of 2012, said it was an easy decision to make: “It was. It's great news to sign a new deal here and I'm really happy. I've been here for a few years now and feel really happy. To sign a new deal and commit my future, it's a great feeling. “It's great from the club. I've committed my future here and it's a great club to be part of. It's a club I feel is going to be back to where we were last year. Being part of the last promotion, I feel the squad we've got now has got a real chance." And boss Sean Dyche added: "He's done very well over his time here. It's so pleasing that he's come through a tough injury. Unfortunately others are coming through that now or fortunately because Sam's shown good signs of how you do come through it. He's been very good since I got here. He's grown into what we do here, he believes in what we do here for himself and his team-mates and that's a key factor."